In our previous blog post we briefly covered a quick introduction to GST. Today, we will talk about how the proposed Goods and Services Tax is expected to work with Flowchart image references for your understanding. >GST is proposed to be implemented as a dual GST with the Centre and State governments simultaneously levying GST across the value chain. GST for transactions within a State. Below is an example of how both the above taxes will work. The below table also explains how the credit of input taxes is available from one stage in the next stage. What are some of the benefits of GST? >Easy compliance: A robust and comprehensive IT system would be the foundation of the GST regime in India. Therefore, all tax payer services such as registrations, returns, payments, etc. would be available to the taxpayers online. >Uniformity of tax rates and structures: GST will ensure that indirect tax rates and structures are common across India, thereby increasing certainty and ease of doing business. >Removal of cascading: A system of seamless tax-credits throughout the value-chain, and across boundaries of States, would ensure that there is minimal cascading of taxes. >Improved competitiveness: Reduction in transaction costs of doing business would eventually lead to an improved competitiveness for the trade and industry. 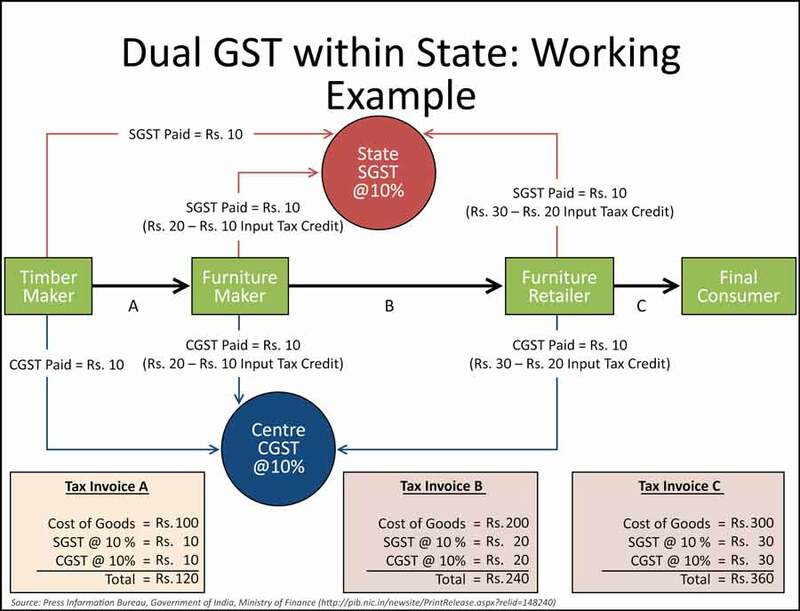 >Gain to manufacturers and exporters: The subsuming of major Central and State taxes in GST, complete and comprehensive set-off of input goods and services and phasing out of Central Sales Tax (CST) would reduce the cost of locally manufactured goods and services. The uniformity in tax rates and procedures across India will also go a long way in reducing the compliance cost. 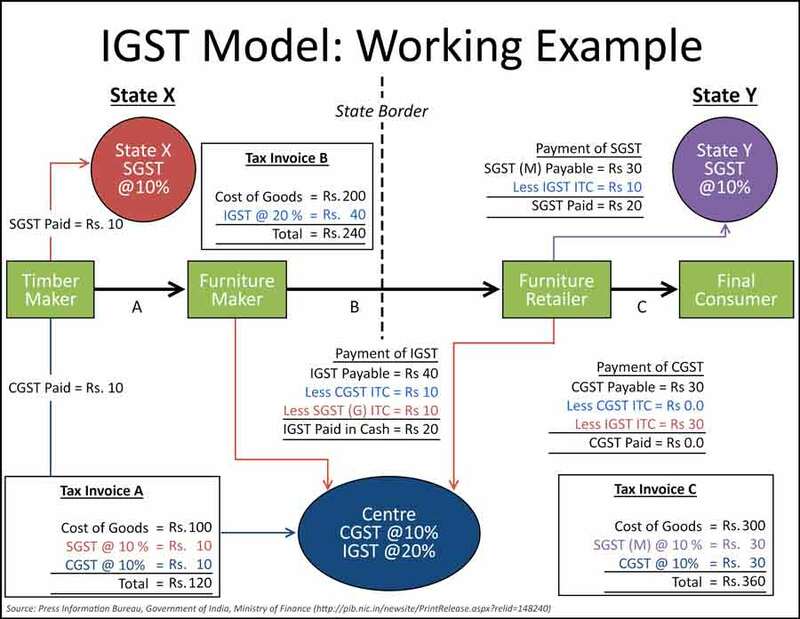 We hope this article helped you understand the GST framework much better. You can now apply for GST using our exclusive offer on Amazon Sellers by clicking here. Note: The content/ information mentioned above with respect to GST has been derived by Amazon Seller Services Private Limited ("Amazon") from the Press Information Bureau and GSTIndia.com is only for informational purposes. Amazon does not guarantee whatsoever as to the accuracy; completeness or usefulness of any information contained herein and assumes no responsibility for consequences resulting from the use of the information thereof. Please reach out to your Tax Consultant or GST service provider for any clarifications/ queries regarding GST.